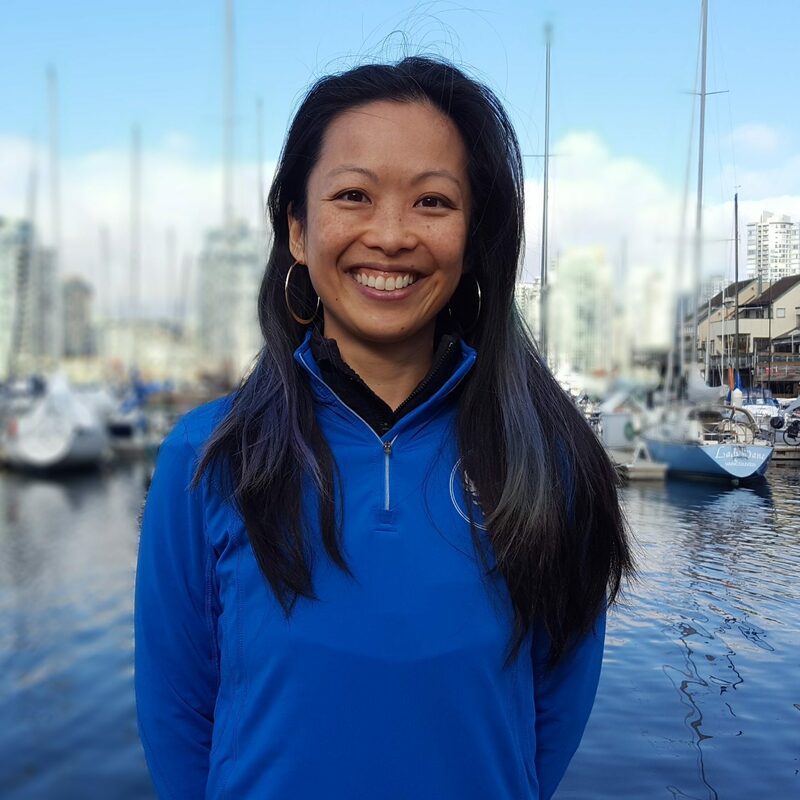 Le Physique | Vancouver Personal Training | Water: How much is enough? There are complicated ways of calculating ounces per thingamajigger (yes, that’s the scientific term), and if you have X% muscle mass to fat ratio and running in Y degrees carrying a small hairless chihuahua for Z km on an average incline of 3% over that distance, then you should be taking in ABC litres of water. Filtered, alkaline, with a sliver of the newest non GMO super-berry, of course. 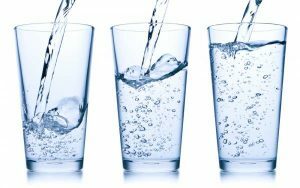 If you are drinking water regularly throughout the day to the point where you don’t feel thirsty, this is a good start that you may be meeting your water needs. The pee test is a good one as well – if your urine is pale yellow, that’s a positive sign too (I’m not sure who ever started the trend that one’s pee needs to be clear, this person needs to seek medical attention). Some studies report that the average sedentary person requires about 1.5 liters of water per day, so imagine if you’re doing more activity (than sitting in an office or shuttling your kids around all day), or in different environments, this can increase your water intake needs. What factors affect fluid intake? Exercise: Any type of activity that makes you sweat requires you to replenish those fluids! An extra 1.5 to 2.5 cups is a good start for light exercise. If you plan to do more intense exercise, or plan to be active for longer periods of time you will need to drink more. It is recommended to drink a sports drink during periods longer than 90 minutes of activity to replenish sodium and electrolytes lost in sweat. 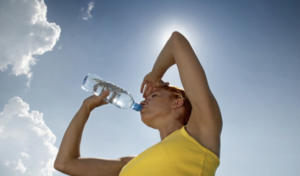 Environment: Hot and humid weather can make you sweat more and therefore require more water intake. Be careful when exercising outside, and take note of how your body is feeling. Increase your daily water intake by at least 2 cups when in extreme heat. One tip we learned in university, was to weigh yourself before starting activity or exercise. When you’re finished, weigh yourself again. That amount of weight lost (through sweat) is how many ounces of water you should take in to replace fluids. 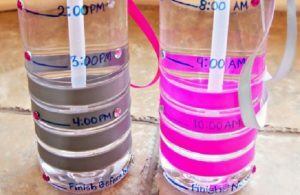 1) Mark a water bottle with times you must have that amount finished by. This will help you to spread out your water intake throughout the day and avoid feeling thirsty. (Okay if you’re a guy, the pink might not be inspiring, but the point is to make your own). 2) Drink a glass of water with each meal and snack. 3) Begin building the habit of drinking water before, during and after exercise. Better yet, make your friends remind you, or use a water break to stall when your trainer asks you to do another set of burpees. We’ll never deny you water during a workout! 4) What’s your favourite temperature? You may find that a cup of cold water just doesn’t work well with your system, but prefer room temperature. Some Asians have a thing for drinking hot water all the time (don’t ask, it’s just the way of my people), and I find that when a cup of hot water is put in front of me, I’ll drink it. My husband will only drink cold water. Find out what your favourite style is, and go with it! 5) Hate the taste of water? Is it TOO BORING? 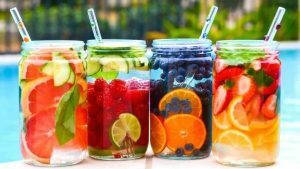 Try fruit or tea infused water! Ridiculously easy to make on your own, just cut a slice of lemon or cucumber (or favourite brand of white tea) and pop it into your manly home made, time marked water bottle and BAM! Bob’s yer uncle, you have flavoured water. This is a bit fancy schmancey for me but you get the idea. 6) Chase a glass of your favourite beverage with a giant glass of water. I use this trick often while at my desk and it works like a charm. I double my fluid intake, and created an excuse to stop staring at my laptop. 7) Make your drinking vessel intriguing. I’m fickle, one day it’s a plastic water bottle, a week later I prefer a glass one, and the next day I’ll drink water only from my husband’s cup (I never said I was normal). Starbucks has those neat clear tumblers that allow you to write your own messages on it, or put in photos of friends and family – if you need to be inspired to drink (water), don’t judge yourself for it – just run with it!